Our innovative bikini formulation brings a unique hair-removal solution to the problematic bikini area. The hair itself is thicker yet the skin is delicate and sensitive. That’s why our bikini formula contains high levels of soothing organic Aloe Vera and Chamomile. What makes this cream so exceptional is that while removing your hair, the 26 Dead Sea minerals and mud provide a protective and replenishing spa treatment, renewing skin and giving you a smoother, cleaner-looking finish than ever before. Water (Aqua), Calcium Hydroxide, Cetostearyl Alcohol, Sodium Lauryl Sulphte, Thioglycolic Acid, Allantoin, Aloe Barbadensis Leaf Juice, Glyceryl Stearate Panax Ginseng Root Extract, Anthemis Nobilis (Chamomile) Flower Extrac, Calendula Officinalis Flower Extract, Rosmarinus Officinalis (Rosemary) Leaf Ext, Cucumis Sativus (Cucumber) Fruit Extract, Sodium Hydroxide, Silt (Dead Sea Mud), Fragrance, Arnica Montana Flower Extract, Sea Salt (Maris Sal/Dead Sea Salt), Argania Spinosa Kernal Oil, Mentha Piperita (Peppermint) Oil, Tocopheryl Acetate, Oenothera Biennis (Evening Primrose) Oil, Menthol, Iron Oxide. PRECAUTIONS: For External use only. Not for use on mucous membranes; the lips, eyes, nose, perianal or genital areas, the face or breasts. Do not use on scars, moles, spotty, broken, irritated, shaved or sunburnt skin, on skin which has been depilated in the last 72 hours or on skin which has suffered an adverse reaction to hair removal creams in the past. After use, we recommend waiting 24 hours before applying an anti-perspirant, a perfumed product, swimming or sunbathing or using artificial tanning equipment. Always wait 72 hours between applications. Remove all jewellery. If the cream touches any of the areas not intended for use rinse thoroughly with cold or lukewarm water. If irritation occurs, consult your physician. SAFETY INSTRUCTIONS: ALWAYS TEST A SMALL PATCH OF SKIN (WE RECOMMEND THE INSIDE OF YOUR WRIST) WITH THE PRODUCT 48 HOURS BEFORE USING ON OTHER AREAS OF YOUR BODY. Designed to be used on the external bikini area. If a rash, reaction or irritation occurs, DO NOT USE THE HAIR REMOVAL PRODUCT. Avoid contact with eyes. In the event of contact with eyes, rinse immediately with plenty of water and seek medical advice. Avoid contact with skin except as indicated on the precautions. Wash hands after use. Store in a cool, dry place. Do not store contents under direct sunlight. Dispose of empty packaging with household rubbish. 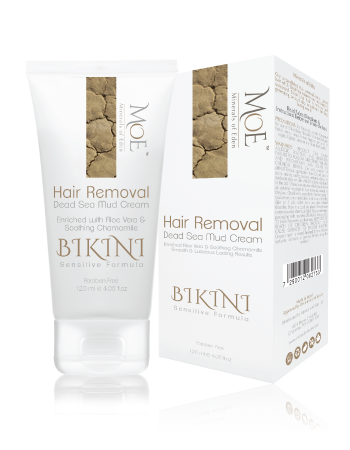 This is the best bikini hair removal product I have ever tried. It is gentle and easy to use. Highly recommended! Works in just 6 minutes, Coming Back! I have used many hair removal cream products before but I think this one is probably the best. While it cleans off the hair the first time, if you miss a spot you can go back and it won't burn.